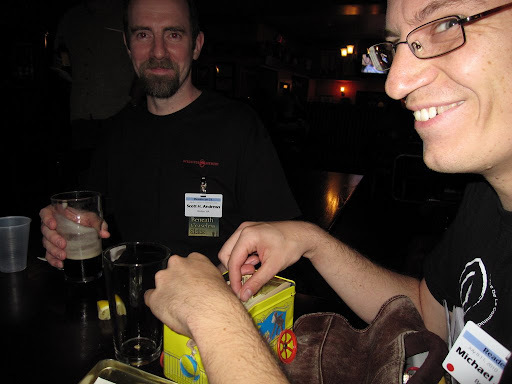 the fiction of Scott H. Andrews » Blog Archive » ReaderCon, Well Met! Got back from ReaderCon yesterday. It was awesome. I saw and drank with lots of people I knew (Tom Crosshill, Maggie Ronald, Anne Cross, Mike Allen, Jay and Erin, my eternal partner in barley Mike DeLuca, and many others), met and drank with lots of new people I now know (Matt Kressel, Corry and Mary, Rajan, Amy, Mishell Baker, and many, many others), and had great interesting conversations with all of them. The BCS reading had eight authors, including one right off the airplane! :) And the room was packed with readers and fans. Thanks to everyone who read and everyone who came to listen. And especially to everyone who came up to me in the Dealer’s Room or at parties and said they really like the magazine. That is always awesome to hear, each and every time, and I’m delighted you’re enjoying our fiction. This entry was posted on Monday, July 12th, 2010 at 2:31 pm and is filed under my magazine, SF/F, writing. You can follow any responses to this entry through the RSS 2.0 feed. Both comments and pings are currently closed.